IF HE had listened to his music teacher’s advice, we wouldn’t be listening to Bill Dalton now. At 16 his school report read: ‘William is musically incompetent.’ Discouraged, he went on to pursue a career in science teaching and engineering. Yet now he is an accomplished multi-instrumentalist with three albums under his belt, has recorded and produced a wide spectrum of artists, conducts workshops, is a music festival MC, teaches steel guitar and ukulele, and runs his own studio. As if this were not inspiring enough, Bill was diagnosed in 2003 with a life-threatening condition, but overcame it. His latest release, Ragout Celtique, features two other musicians who had also been gravely ill. The trio go by the name of the Remission Cowboys. After graduating from University College Swansea in Materials Science and Technology, Bill became a physics teacher in Manchester before moving into the engineering industry. He says: ‘I spent many an hour hanging out in (now sadly gone) Decoy Records, Manchester, where I was introduced to a musical palette that spread all over the world. 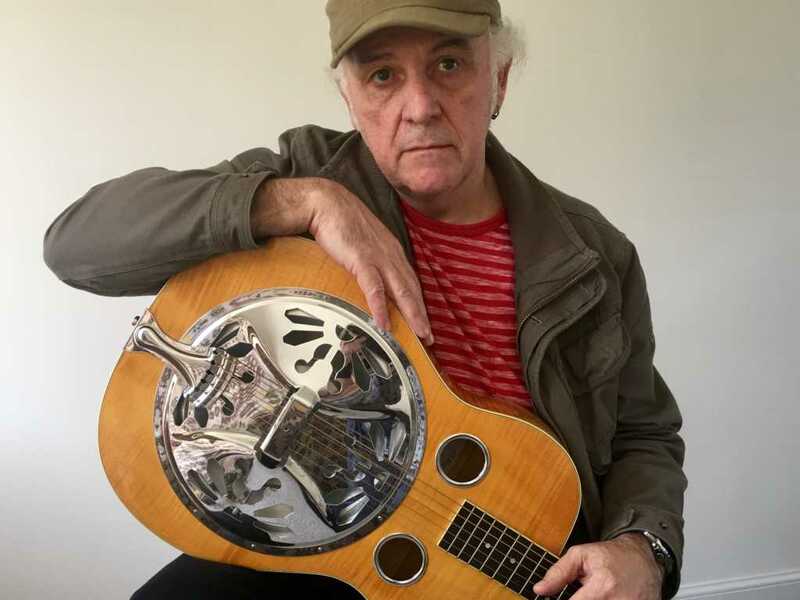 It was in 2000 that Bill started to learn lapstyle resophonic guitar, the instrument formerly known as the dobro, and became inspired by Grammy Award-winning musician Stacy Phillips at the world-famous Sore Fingers Summer School in Kingham, Oxfordshire. Three years later a serious illness forced him to give up work. ‘Aside from the wonderful loving care from my wife Mary, making music became a great healer,’ he says. Having twice attended the Rockygrass Academy in Lyons, Colorado, where his tutors included more Grammy winners, Rob Ickes and Sally Van Meter, he returned to college to study music production and live sound management, graduating with distinction from the School of Sound Recording in Manchester. He and Mary subsequently transferred his Earwig Studio earwigstudio@gmail.com from Bolton to Lancashire’s beautiful, rain-soaked Ribble Valley. His first two albums were Grass Cuttings, which features contributions from an old friend, the Canadian dobro and slide guitar specialist Doug Cox, and Uke Ant Bee Sirius, a ukulele workout. By 2008 Bill was himself teaching at Sore Fingers. It was there that he jammed with Led Zeppelin bassist John Paul Jones (on mandolin) and met his future Remission Cowboys collaborators, Peter Woodman from the Isle of Man and Richard Hampton from Romsey, Hampshire. ‘We shared good wine into the small hours, played music and laughed ourselves silly,’ says Bill. He is understandably reluctant to go into details about the malignant diseases that would afflict the three, but adds: ‘Peter and I had both overcome the worst and continued to get on top of our conditions and were mending well when I found out that Richard was under treatment after a scary diagnosis. ‘It was then that I had the idea for creating the album. Initially it was to be a solo effort but I saw an opportunity to keep us all in contact – despite the distance separating us all. Peter and I had discussed on many occasions how music had helped us through difficult times. Whilst Richard was undergoing treatment he told me how working on tunes had provided an all too rare diversion from grim reality. Everything else being: resophonic guitars, Fender acoustic guitar, baritone ukulele, tenor ukulele, concert ukulele, charango (a small Andean instrument of the lute family), nose flute (yes, really) keyboards and percussion. Now that’s what I call incompetent. Ragout Celtique is a smashing little album. Bill plays beautifully, combining warmth with great precision. Most of the tracks provide a Celtic slant on traditional tunes, although the highlight for me is a Dalton original – Meander to Sawley. Beginning with the sound of boots sloshing through the mud beside the River Ribble in customary flood mode, this is a delightful musical excursion. As I told Bill on first hearing, it could sit comfortably on any album by such guitar greats as Leo Kottke or the late John Fahey. To hear it, click here to access Bill’s YouTube channel. There are two other tracks there which feature the full Remission Cowboys lineup, plus excerpts from his other discs. Also visit his website, to buy the albums, which are disappearing fast and will soon be collectors’ items. Regretfully I must report that Richard Hampton is no longer with us. Ragout Celtique is dedicated to ‘Richard, who sadly did not make remission’. Bill’s mentor Stacy Phillips has also died, bringing a bluegrass tinge to the heavenly choir. Footnote: Not content with being a musical virtuoso, Bill is also an authority on wine. He works part-time at the Clitheroe branch of a national retailer – (beginning with M and ending in C) – which means that I can expand my musical knowledge while replenishing our cellar. That’s my excuse for spending so much time and money there, anyway. Previous Post Previous post:Have a Go!